The curtain rises. The pilgrimage of four devotees commences with the worship of the Lord. Their sanctified offerings are ready to be carried to the shrine. They embark on their journey through a difficult trek in the hills and jungle terrain of Shabarimalai, South India. 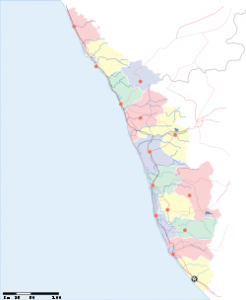 While they negotiate their paths the mythological story of Ayyappa is unravelled. This is the production of ‘the Lord of the Sabari Hills’ presented by none other than the Ananya Samarpana team at the ‘Marana Auditorium’ at Hurstville, on 25th April 2010 under the direction of Ambika Prasad. 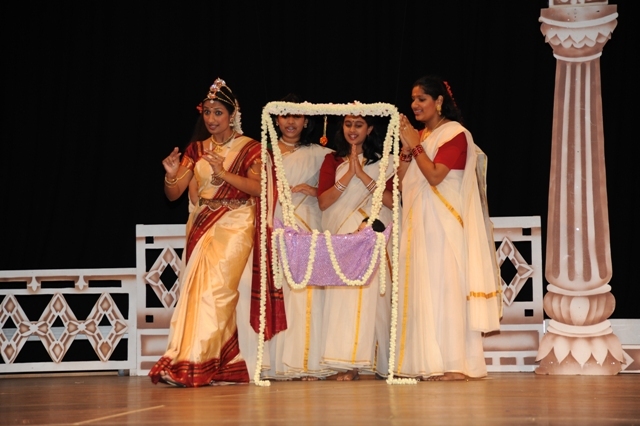 The Ananya Samarpana team is famous for its dance dramas especially on Indian mythology, bringing across Indian culture and spiritual values to the growing population of Indian families in Sydney. They make a thorough study of the subject of their performance. 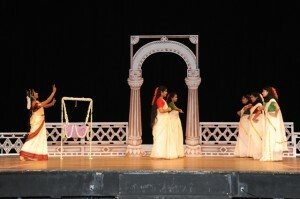 Their rigorous practice and dedication creates a magical spell on the stage. Today they took the audience to a different world. The story of Lord Ayappa, through a medium of dance drama, was presented by children and youth of various ages absolutely brilliantly. The stage settings were a feast to the eyes. The royal attires were grand. 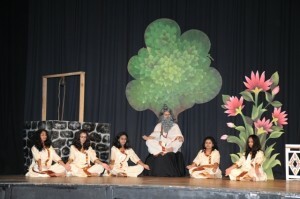 Aditya Vyas as King Rajashekara, Kirthega as Queen and Adithya Rao as Deewan performed well. Mohini and Shiva’s dance was remarkable. Vaishnavi Varan as Shiva was great and the audience was memerised with Mina Sreenivas being totally enchanting in the role of Mohini. Amita Rao as Manikanthan (Ayyappan) was lively throughout and suited this role most appropriately. A cradle from heaven dropping down for Manikanthan and the Queen (Kirthiga Nadarajah) and the Sakhis (Samhita Sawant, Gargi Bellave and Sandhya Reddy) full of awe. The setting of the Guru Kula was wonderful and the choreography for the Guru’s teaching many arts including martial arts was outstanding.The highlight of the whole dance drama though, was Mahishi’s enactments. Karunya Prasad in the role of Mahishi and her agile maneuvering of her acts deserves special appreciation. The transformation from a Buffalo- Demon to the Demoness- Mahishi was superb. The nature dance by children with Manikanta was also a pleasing performance. The return of Manikantan with tigresses and his decision to leave the world and enter into eternal meditation, brought tears in the eyes of many of us – the audience. Finally reaching the Sanctum Sanctorum and the vision of Makara Jyoti brought a sense fulfillment in us, as if we ourselves had completed the pilgrimage. Mahishi (Karunya Prasad) and her assistants (Karthik Venkatesh, Krishna Venkatesh, Akshay Rao and Praneet Namakal) reign terror in the underworld. This was an outstanding achievement, which we never imagined possible in Australia, with over fifty participants. The beautiful settings were a memorable effort by Gowtham Bangalore and Sri Prasad Tadipatri who have handled the properties in such a professional way, which can only be compared with the famous dance drama troupe “Prabhath Kalavidaru” from the state of Karnataka in India. The idea of power point presentation along the pilgrimage gave us a practical knowledge of the trek, thanks to the efforts of Sri Dakshina Murthy. Special mention must be made of pilgrims: Chowdappa Narayan as Perisamy, of Nagashayana Bellave as the father, of young grandmother Savitha Narayan, and above all of Ashish Madhyasta as the pilgrim grand child, who performed their roles with fervour. 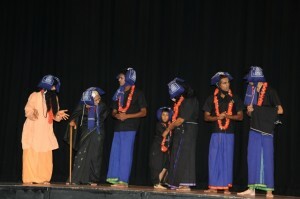 Chowdappa Narayan, Savita Narayan, Rahul Tamilarasan.. Ashish Madhyastha, Nagashayana Bellave, Gokul Tamilarasan and Aditya Prasad. Another beautiful feather in Smt.Ambika Prasad’s cap, whose brain child “Ananya Samarpana” is producing such outstanding results. Credit also goes to the scores of other children, youth, elders, parents and members of the Samarpana team who have helped on and off stage. Sydneyites like myself are eagerly waiting for Ananya Samarpana’s next production.